I am working with our new homeschool group on a book club that was started by an amazing lady who graduated two sons from her home school and still volunteered her time to participate in our fledgling group but now has some seriously important work to attend to. I am going to try my hand at getting the next couple of sessions going until we can get some better organization in place or see if the group has any desire to continue. The books that have been chosen are The Kitchen Madonna by Rumer Godden for the older crowd and Pascual and the Kitchen Angels by Tomie DePaola for the littles. I thought that we would do a craft for the younger ones based on Melissa's awesome idea and offer a snack of homemade bread and cheese like the angels would have made in the story. 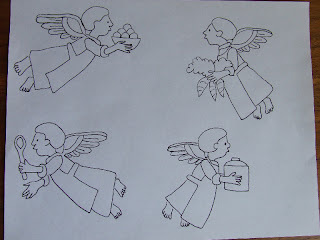 First, I made a page of four angels to be colored by each child. You can print your own copy here. For the older kids, I made a mock up of a Kitchen Madonna using only those things I had in my craft bin so forgive its crudeness. 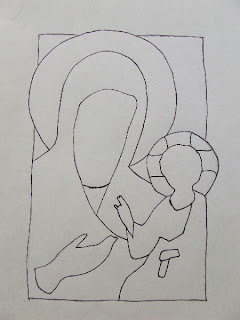 First I drew an outline of the major parts of an icon, cut out the hands and faces, and used the other pieces as templates for robes and tunics. 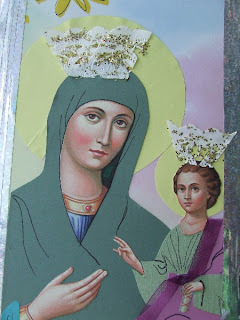 I think I can get some fun scrapbook paper for the robes and veil, gold doilies for the crowns and halos, maybe some fun ribbon to fill in the sides. Sequins can be glued on to add even more embellishment. What do you think? Would boys and girls age 9-13 be interested in a craft like this? DEFINITELY!!! You are so creative! Please post ALL your ideas for this book club. Think of me as a far away member! I will be following along here at home. Any 9-13 yo should be interested in these projets, esp. the icon!! I LOVE this! I know my kids would be interested! What do I think? I think it's lovely! 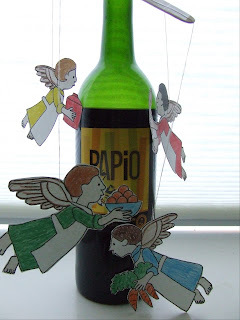 I am especially fond of that sweet little mobile; with or without the vino, it's a keeper. Both of those books made a big hit around here the first time we read them, though come to think of it, the kids haven't read The Kitchen Madonna. That was me. When I said "crude", I only meant that since I couldn't get to the store, I had to use what I had on hand and some of it wasn't in its best shape. It is beautiful, Matilda! How creative you are in so many areas. Lovely!! These are great! What fantastic selections and activities for a book club. I've always admired the kitchen angels Melissa did and yours are enchanting as well. I want to start a book club here, too, and this would be a fun start. Beautiful crafts. Will you be sharing this drawings. I did not find a link to them. Please let me know. 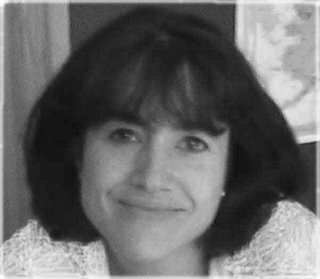 When I originally wrote this post four years ago, I provided links in another post. I went ahead and added them to this post since I guess it's being linked to as new again now.